It’s been a little more than a year since I got my Pentax 6×7, but writing this kind of in-depth review is no small task. And the 6×7 is no small camera, either. In the time I’ve had the 6×7, I’ve acquired a second body, a full range of lenses, filters, hoods and other accessories, and the 6×7 has wound up replacing my Nikon kit for serious photography. I’ve already hauled it all over Colorado and into southern Wyoming, and at one point thought I’d worn out whatever life it had left when I got it. I first began to think that 6×7 was probably my ideal format two or three years ago, and very quickly settled on the Pentax 6×7 system for my wish list. I was drawn to it mostly by the relative affordability and wide array of superb lenses, and the SLR form factor. I’d already used a Mamiya RB67 and found that it simply didn’t work for me. I don’t mind the size or the waist-level viewfinder — I love looking down at my TLRs — but it wasn’t a system conducive to my style of picture-making. It’s not that I mind taking my time, but often I just want to lift a camera to my eye, make a few adjustments quickly, and release the shutter. 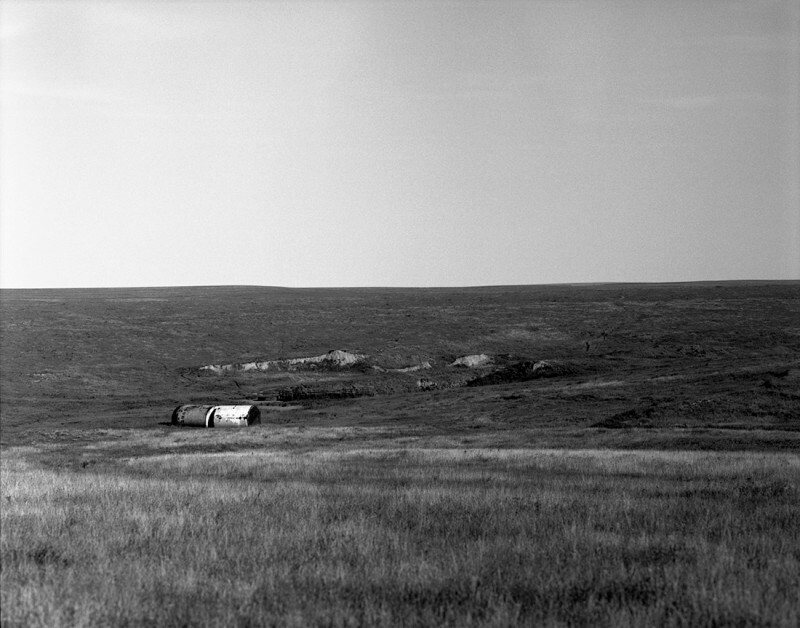 The 6×7 system is operationally everything I like about a 35mm SLR like my Nikon FM2n, with excellent glass and huge medium-format negatives — nearly five times the area of 35mm negatives. 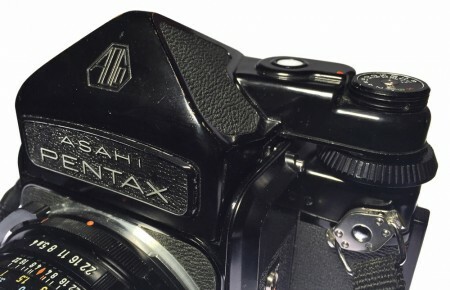 Asahi called 6×7 the “ideal format” in early literature because the negatives are almost the exact same aspect ratio as an 8×10 or other common print sizes, and the Pentax system appears to have been one of the first in the format. The Pentax 6×7 system comes in four basic flavors: Original 6×7 (no mirror lockup), 6×7 MLU (with mirror lockup), 67, and 67ii. First released in late 1968, the original version got some upgrades in 1976. 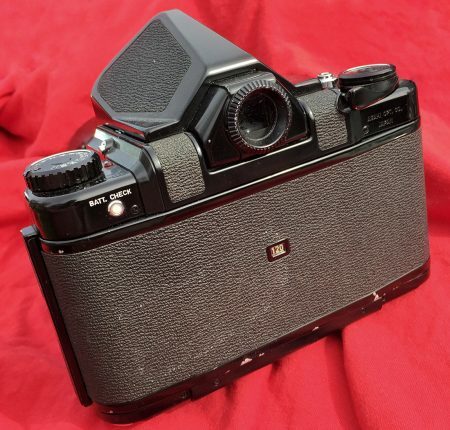 The most notable was the addition of mirror lockup, although this was retrofitted by the Asahi factory on earlier versions of the camera for many years. Other minor improvements included the flip-up latches on the spool holders. 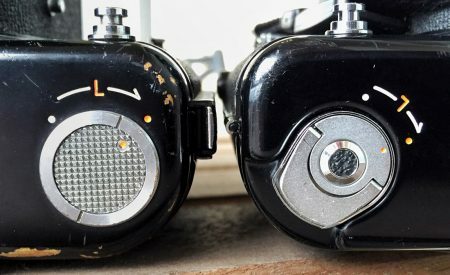 The flip-up latch style was already used on the battery holder, but earlier versions of the camera had flush, knurled knobs that had to be rotated by friction to pop out and release the spools. In 1989 the system got a more significant upgrade, with the biggest change being the partially-mechanical shutter going fully electronic (even the earlier versions will not fire without a battery, however), and losing the “x” in the name. The final revision, the 67ii, was released in 1998 and produced until April, 2009. The 67ii upgraded the timer, replaced the PC sync socket with a proprietary flash connector, added LCD displays on the top cover and to the metered prism viewfinder attachment, and added a right-hand grip to the body, among other improvements. Meant to be a workhorse from day one, the 6×7 is built like a tank — and weighs nearly as much. 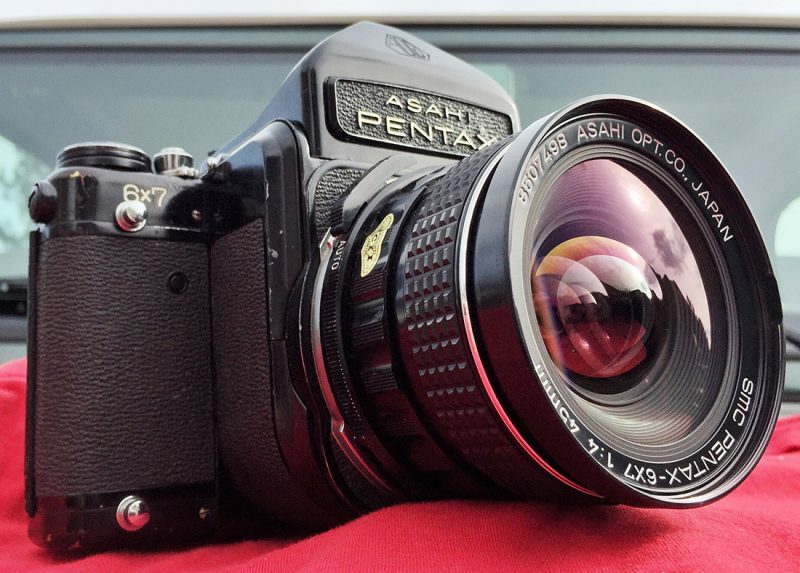 While it is constructed much like a 35mm SLR, everything is twice as big (or more) — meaning the pentaprism alone weighs more than a pound. The controls are laid out much like a 35mm SLR, though, which makes adoption easy. No doubt Asahi intended as much, as the 6×7 was marketed as an easy way to move into medium format. 6×7, by the way, is a slight exaggeration — the 6×7 system produces a negative 55 millimeters by 70 millimeters (it’s impractical to make the image a full 60 millimeters wide since that is the full nominal width of medium format film, though most 120/220 film is 60.5-60.75 millimeters in actual width). Available shutter speeds on the electronically-controlled cloth focal-plane shutter range from 1 second to 1/1000 second, as well as Bulb and flash sync speed (marked “X”). Time exposures are possible by setting the shutter speed dial anywhere in the unmarked space between the “X” and 1/1000 second marks. Flash sync is an appallingly slow (for the era) 1/30 second, although several leaf-shutter lenses are available which will sync at any speed up to 1/500 second. The shutter release button is threaded for a standard cable release, and has a collar that rotates about 45 degrees to lock out the shutter. 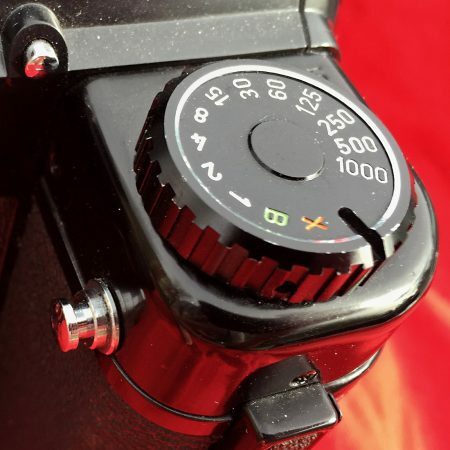 On the front of the body, just below the shutter release, is a small, flush-mounted button that resets the shutter if the mirror locks up due to a dead battery. Depress it with a chopstick or other similarly narrow instrument (it’s plastic, so avoid things that might damage it, sturdy as the 6×7 is), and then depress the shutter release button again to release the mirror. The 6×7 system features a unique double-bayonet mount system, which consists of a mounting ring with locking tabs on both its inner and outer circumferences. The inner locking mount is used for most lenses — up to the 300mm focal length — while the larger outer mount is used for the longer telephoto lenses (up to 1000mm). 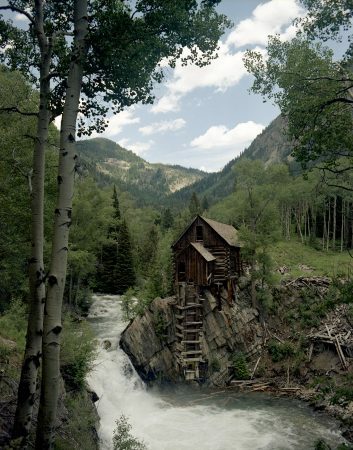 Both 120 and 220 medium format film can be used in any 6×7 system camera. A reminder in the center of the back cover is set by sliding the pressure plate to one side or the other, and a switch on the top right shoulder of the body selects the mode for the film advance and frame counter. 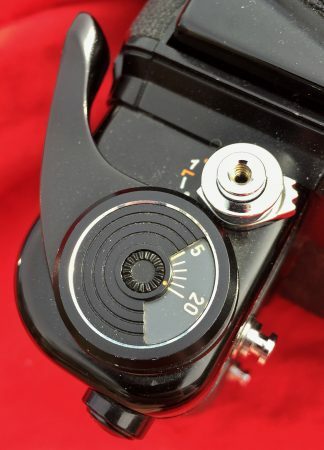 There are two starting marks inside the camera for loading film (the 67ii model uses only one starting mark, and can squeeze 21 frames onto a roll of 220 film as opposed to the earlier models’ 20 frames). The 67ii also has a film type reminder slot you can slide the tab of a film box into. The film advance is a single-stroke lever, which automatically advances one frame at a time until 10 (or 20, if the format switch is set to 220) exposures have been made. The advance lever can be moved again after the film has been advanced, albeit with noticeably greater resistance, which may affect frame spacing negatively (more later). Loading film is much like other medium format cameras. Pull the small latch on the lower left corner of the body to release the film door and open it. There are film spool retainers at either end of the bottom cover. Depress and turn, or lift the latch and turn, then the retainers will pop out or pull out, releasing the bottoms of the spools. Move the empty spool to the take-up side and align it with the tab attached to the advance lever (at the top), lean the spool in, and lock the retainer back in place. You may have to wiggle or rotate the spool some to get everything lined up and locked in. Place the fresh roll in the left-hand side in similar fashion and pull the backing paper to the take-up spool. Using the advance lever, wind the film ahead to the starting mark (be sure to mach the type of film to the appropriate start mark) and close the back. Operate the film advance 5-6 times to get the frame counter to “1” — the last operation of the film advance level will offer considerably more resistance than the previous 4-5, and the advance will resist another operation afterwards. Easy: Open the back and use the knurled center to turn the frame counter past zero. Hold it there and close the back. Your camera will now fire the shutter indefinitely. Less easy: Use the purpose-built shutter-cocking key that was included with the camera by Asahi (most used cameras are now sold without the key, and they go for as much as $50 by themselves lately). It is inserted into a slot in the edge of the back with the door open (consult page 5 of the manual for more detailed instructions). Mirror lockup (if equipped) is engaged with a switch on the right side of the lens mount. The mirror is gear-driven and held up by an electro-magnet, which means long exposures can drain the battery considerably. I always carry several spares. The 6×7 uses a 4SR44/A544/PX28 battery, and alkalines are generally not recommended — silver oxide or lithium will last much longer. There is a battery check button on the uper left corner of the camera back, which illuminates an LED next to the shutter speed selector. The battery holder is released from the camera by a flip-up-and-twist lock similar to those on the film spool retainers on most models. When the battery is dead, the mirror will lock halfway up. To change lenses, press the lens release switch in toward the body, and rotate the lens until it is free. Attach another lens by lining up the red marks, sliding the lens into the mount and rotating it until it locks. This won’t be new for anyone who’s owned almost any SLR camera made in the past 50 years or so. Do not change the viewfinder with a lens attached, as the delicate chain that couples the aperture to the metered prism can be damaged or broken during re-installation — just take the lens off anytime you change finders. It is safe to remove the finder with the lens attached, but remove the lens before reinstalling the finder. It’s worth noting that the Pentax 6×7 has no self-timer unless you upgrade to the much more costly 67ii. There is no power winder option, and you cannot make multiple exposures except with the 90mm leaf-shutter lens, which has a cable release socket that can be triggered repeatedly independent of the focal plane shutter in the body. There is no autofocus (duh). There is no hot shoe, although you can get a cold shoe with the optional wooden grip accessory that attaches to the body’s accessory lugs. There are two PC sync sockets on the left side of the lens mount marked “X” (X-sync, for electronic flashes) and “FP” (“Forward Point” — similar to M-sync, but for use with the faster Forward Point-type flash bulbs). There is, however, an interchangeable viewfinder system with multiple options available, an interchangeable ground glass focusing screen, depth of field preview (Auto/Manual switch on the lens, just like the little Takumars), and an external battery pack adapter for cold weather. A sturdy tripod socket is well-placed below the lens mount for excellent balance even with some of the longer lenses in the system. 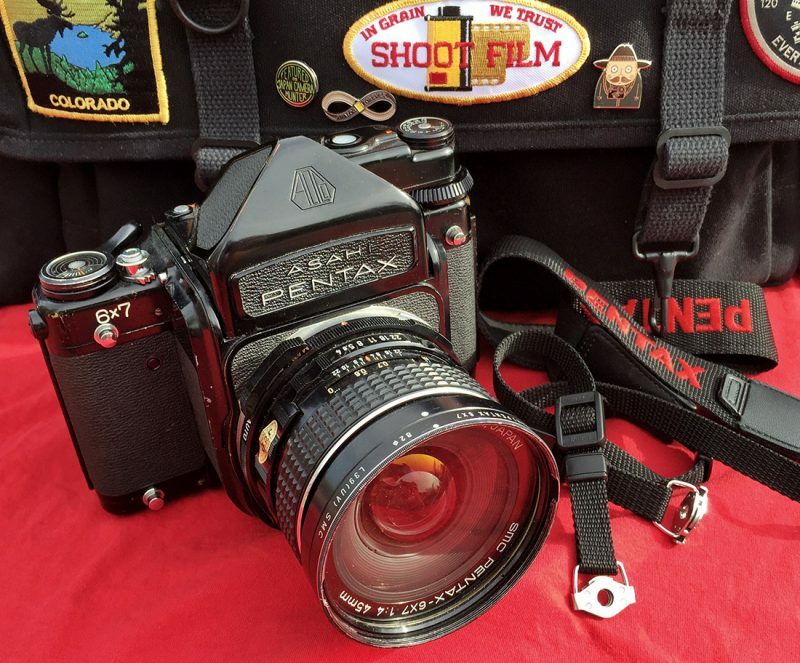 The Pentax 6×7 was a system camera from the get-go. It was released with a multitude of lenses and interchangeable bits. Standard prism: No light meter, just a giant pentaprism. The eyepiece threads in and diopter adjustment is possible with original Pentax correction lenses (if you can find one), or possibly at a local optician. Offers 90 percent coverage. TTL prism: Adds a light meter, coupled to the shutter speed dial, power system and lens aperture setting. No exposure compensation. Simple optical, mechanical match-needle display in eyepiece. Film speed selector with speeds from ASA 12 to ASA 3200 available. Same 90 percent coverage. Eyecup, 2.0x magnifier and right-angle finder attachments fit into both prism finders. Folding waist-level finder: A lightweight, compact option with a magnifier and 100 percent coverage. Hard to find and relatively expensive in 2016. The 3.8x magnifier flips out of the way for traditional waist-level use. Chimney finder: A fixed vertical finder with a 3.0x magnifier and eyecup, allowing one to look down into the ground glass with the finder right at eye level. Handiest with a tripod. 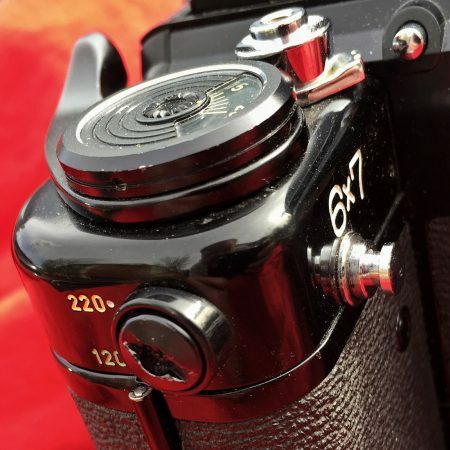 To change the viewfinder attachment, completely depress the two silver buttons on either side of the finder simultaneously and lift the finder attachment gently off of the ground glass. The focusing screen also can be swapped. 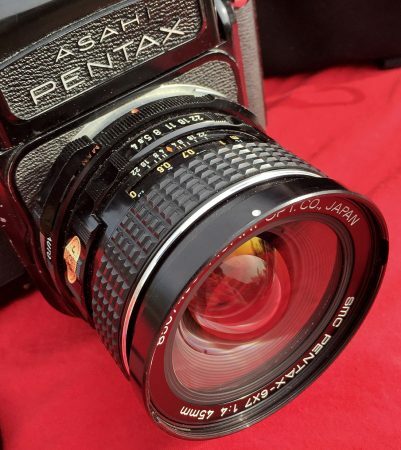 The 67ii model had a brighter screen than earlier versions of the 6×7, and alternate screens were available from Pentax, as well as third party manufacturers like Beattie and Maxwell. From Pentax, screens were available with a microprism center patch, a split image, or a plain matte center spot, as well as cross-lined versions of each. Note that the finders and screens are not interchangeable between the 67ii and earlier models. At the four corners of the front of the body you’ll find four stout posts known as accessory lugs. To these can be attached the accessory grip, a wooden handle with a cold shoe on top and two additional accessory lugs, or the notorious (because of the premium you’ll pay) strap lugs (which are the only way to securely attach a strap of any kind). Though never made by Pentax, aftermarket right-hand grips in beautiful exotic hardwoods and the like, inspired by the grip on the 67ii, have been made available by a number of people for the earlier models. The remote battery cable is about 3 feet long, and allows you keep the battery itself in an inside pocket or other warm spot for working in frigid temperatures. Several carrying and storage cases were available from Pentax, as well, including a beautiful (and surprisingly compact) leather presentation case. Believe it or not, Pentax even made a marine housing for the 6×7. I imagine with a 6×7 you wouldn’t even need a weight belt. I’m not going to make an exhaustive list of all the available lenses here, but I will discuss a few of my favorites. Check out a complete list of every lens in the 6×7 system here, or see this review for pictures of most of them. 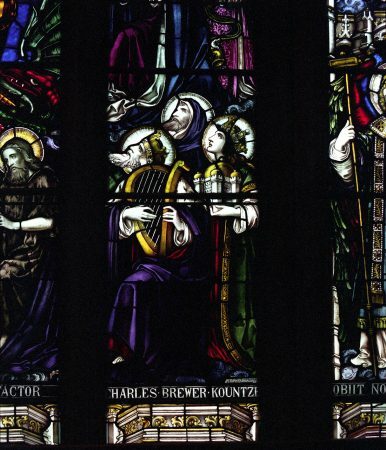 6×7 lenses were made in two broad generations — early and late. They are distinguished by the fluted metal barrel of the early lenses, and the rubber grip on the focus ring of later models. With few exceptions, the internal designs of the lenses are the same across generations. The largest changes in terms of performance are the advancement of the optical coatings. Since about 1971, though, Pentax lenses have had some of photography’s most advanced optical coatings. 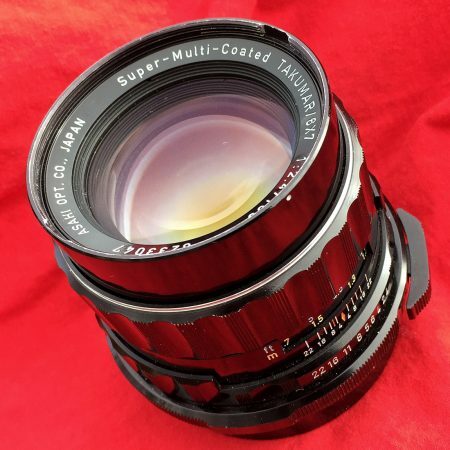 A few of the earliest lenses were labeled “Super Takumar,” but the vast majority of the available 6×7 lenses bore the “Super-Multi-Coated” and “SMC Pentax” monikers and the corresponding more advanced coatings. In terms of sharpness and contrast, it generally doesn’t much matter which version of a given lens you choose. Some of the early Super Takumars and Super-Multi-Coated Takumars did have thoriated glass rear elements which are mildly radioactive, and which can take on a slight yellow cast as they age. The yellow cast can be removed with some aluminum foil and an LED lamp from IKEA, or some time in the sun (the light is what you need, but beware: too much heat can damage the lens). From the 35mm fisheye, to the fabled 105mm f/2.4, and on out to the gargantuan 1000mm (if you carry this near military or government installations, you might want to wear a shirt that says “It’s just a camera!” in giant letters…), the system’s lens selection meets or exceeds that of any competitor systems. 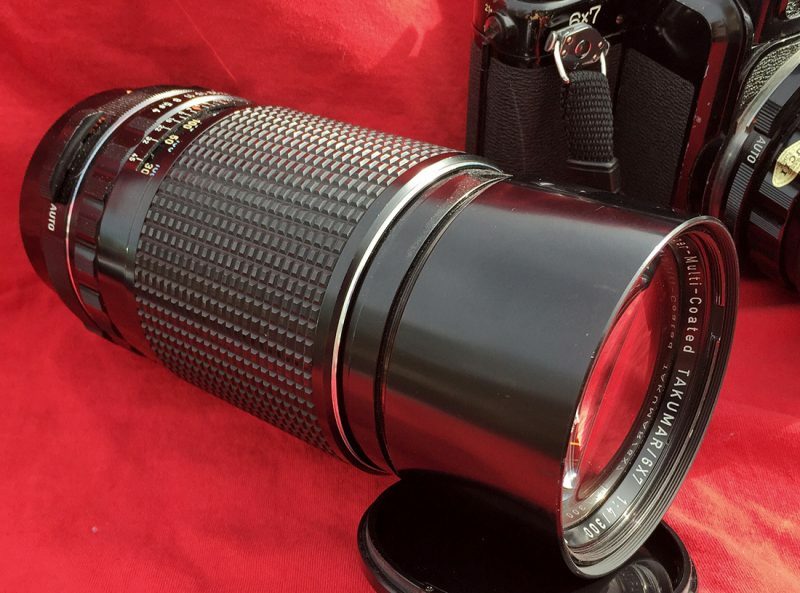 There are even a couple of zoom lenses, like the incredibly highly-rated 55-100mm f/4.5. I started with a radioactive 75mm f/4.5. The aperture sounds mediocre at first glance, but realize that it’s actually pretty huge for the size of the lens elements we’re dealing with. Physically, the 75mm is literally 30 percent larger than a soda can, and about twice as heavy. As for depth-of-field, it’s really quite impressively shallow at f/4.5. 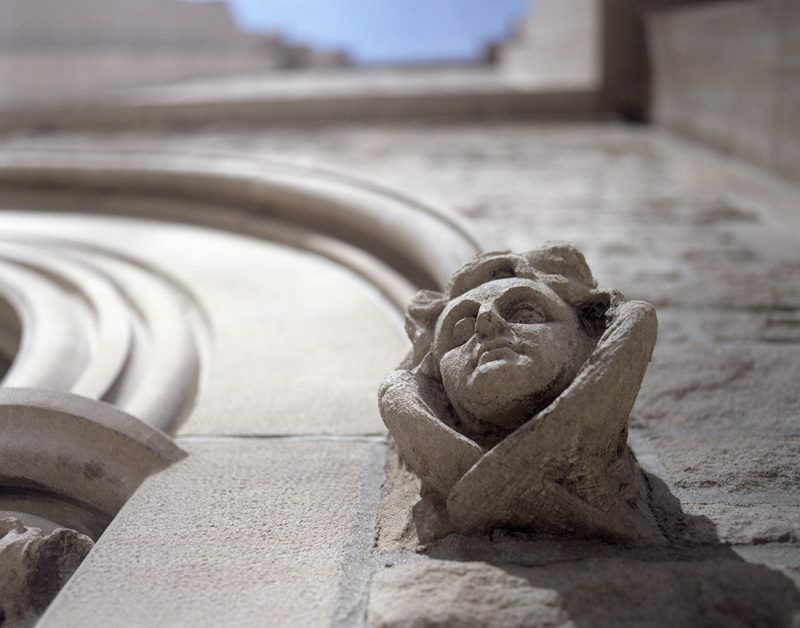 Depth of field, you see, is a function of more than just the size of the aperture. It’s also affected by the image size and the field of view. A 75mm lens on a 6×7 camera has approximately the same field of view as a 37mm lens would on a 35mm camera, and the image area is 4.5 times larger. As a general rule of thumb you can approximate the equivalent depth of field by dropping one and a half or two stops. So f/4.5 on the 6×7 has about the same depth of field as f/2.2 would have on a 35mm camera using a lens with the same field of view. It’s all very complicated, and I can’t claim to understand all the science and math behind these relationships, but start plugging in numbers at the Online Depth of Field Calculator and see for yourself. For reference, to find the 35mm equivalent field of view for a 6×7 lens, divide the 6×7 lens’ focal length by 2.05 (because the diagonal of a 6×7 frame is 2.05 times longer than the diagonal of a 35mm frame — this is the film photographer’s equivalent of accounting for crop factor in digital sensors). Okay, that technical stuff is all out of the way. Let’s talk about the standouts in the system: the 45mm f/4 and the 105mm f/2.4. The 45mm f/4 is an ultrawide rectilinear lens. The field of view is roughly equivalent to a 21.7mm lens on a 35mm camera, and the depth of field at f/4.0 is equivalent to about that of the 21.7mm lens at f/1.9 (around 8 feet — 3 in front of the subject and 5 behind — at 10 feet from the subject). The 45mm also is wide physically, but as stout as you would expect. It is possibly the lightest of all the 6×7 system’s lenses. Nevertheless, it is easier to focus with than the 20mm I used with my Nikon FM2, and considerably sharper (sorry, Nikon!). In addition, the 45mm suffers less distortion than any other lens I’ve used with a similar field of view. It’s not completely free of distortion, but it’s minimal — so minimal, it’s no worse than the longer 55mm f/4 according to most, but note that the 55mm is one of those exceptions — the “SMC Pentax 6×7” and “SMC Pentax 67” versions differ entirely in their construction. In fact, the sharpness and distortion of the 45mm earn it higher marks than the famous 105mm. The 105mm f/2.4 is the standard lens for the 6×7 system, and was for its entire production run of just over 40 years. It’s just slightly longer than being equivalent to a 50mm on a 35mm camera, but the 105’s massive f/2.4 aperture means that at 10 feet and wide open, the depth of field is equivalent to a 51.6mm lens on a 35mm opened up to f/1.1. The 105 is prized for its incredible sharpness, near-total lack of distortion, versatility, and excellent bokeh (if you’re into that sort of thing). It’s achieved a near-cult status in the portrait photography world, and even has its own Flickr group — with one of the most amazing pools of photos I’ve ever seen in a Flickr group, at least in terms of how it showcases the technical excellence of the lens. The single largest drawback to the 105mm is that its minimum focusing distance is one meter — over three feet — which means it isn’t ideal for very close portraits. The 90mm f/2.8 lenses are a popular alternative for much closer work, as they have a minimum focusing distance of roughly half that. Other notable lenses in the system include the 100mm f/4 and 135mm f/4 macro lenses, the 75mm f/4.5 shift (no tilt) lens, the 90mm f/2.8 and 165mm f/4 leaf shutter-equipped lenses, and the 120mm f/3.5 soft-focus lens. Telephoto lenses include multiple version of the 300mm, 400mm, 500mm, and 800mm lengths, and a mammoth 1000mm. There is a lens for virtually every situation. Nearly all the lenses have either a 67mm or 82mm filter thread, with a few 77mm threads and outliers: the early 55mm f/3.5 has a 100mm thread, and the 500mm f/5.6, 55-100mm f/4.5 zoom and 90-180mm f/5.6 zoom are each equipped with a 95mm filter thread. The 35mm fisheye and 1000mm super-telephoto lenses have integral filters that rotate into place with a selector knob, and rear gels can be used with the fisheye. In addition to threads, most of the lenses have a bayonet filter option that works quite well. The bayonet mount is also used for earlier lens caps and fits very securely, though using a Pentax bayonet-mount filter and cap together can be frustrating depending on which of the two bayonets fits more tightly. Bayonet-mount filters were available from Asahi for 67mm, 77mm, 82mm and 100mm sizes in 8 varieties including UV, Skylight and several other colors. Gel filter frames are available for 67mm, 82mm and 100mm filter threads, but all utilize the bayonet mounting system. A variety of square and round lens hoods are available for lenses between 45mm and 200mm focal lengths. Nearly all the longer lenses (200mm and up) have integral lens hoods, as well as some of the later versions of shorter lenses (like the 165mm). 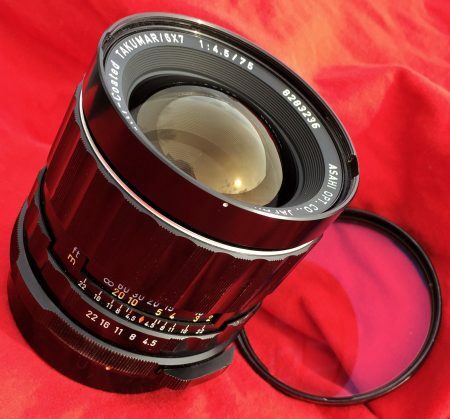 The 75mm f/2.8 lens, released in 2001 as a replacement for the earlier f/4.5 version, had a petal-style lens hood. Relatively few of these lenses were made and they command premium prices today. Petal-style hoods were also available for the two zoom lenses in the lineup. 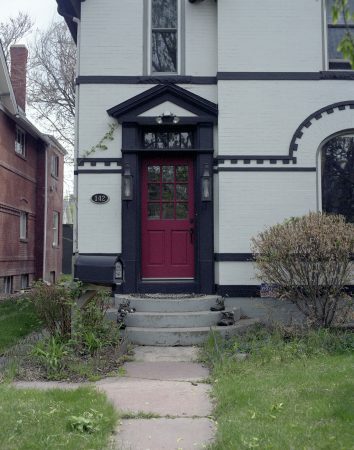 All the square hoods were available in plastic, with some also offered in metal. Certain filters, especially the gel holders, may interfere with their use. Standard threaded filters should work. Seven variations accommodate a dozen lenses across three filter ring sizes (67mm, 77mm and 82mm). Round hoods were available only in a 77mm filter thread, and were available in both a rigid metal version and collapsible rubber. There are 5 total rear teleconverters available for the system with varying usefulness. The late-model 1.4x and 2x converters work with all system lenses, both inner- and outer-bayonet mounts. The T5-1.4x is designed only for use wit the 800mm f/6.7 lens. The earlier T6-2x converter was designed for use only with telephoto lenses and optimized for sharpness at near-infinity focus. An earlier outer bayonet-only 2x converter was also produced, but its usefulness is limited as it does not support open-aperture focusing. Three extension tubes are available: No. 1 (14mm long), No. 2 (28mm) and no. 3 (56mm). They are compatible with lenses from 45mm to 300mm, mount to the inner bayonet and allow the use of automatic aperture indexing. Note that exposure must be adjusted with extension tubes unless you’re using a TTL-metered prism viewfinder, and the exposure factor changes based on both the lens and tube. For more, check out this article on 6×7 extension tubes and its detailed exposure factor table. Two outer bayonet-only extension tubes, and a helicoid (adjustable) extension tube were also available. Lastly, there’s the adjustable Auto Bellows for extensions well beyond what’s possible with any other extension tubes, whether individually or in combination. The system includes two reverse adapters that allow the use of lenses backwards for macro work. 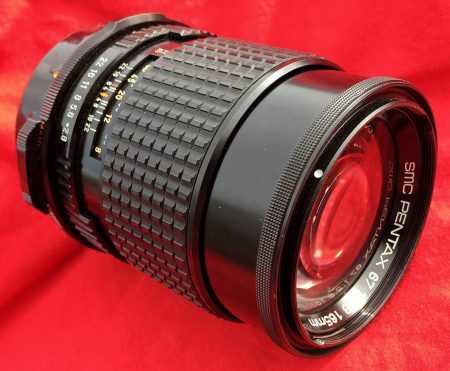 A 49mm version allows the use of many of Pentax’s 35mm K-mount lenses, and a 67mm version allows the reversal of a number of 6×7 system lenses. Reportedly the adapters work well, but can be a bit fiddly. Reversing the lenses, however, results in greater magnification than is possible with extension tubes alone. 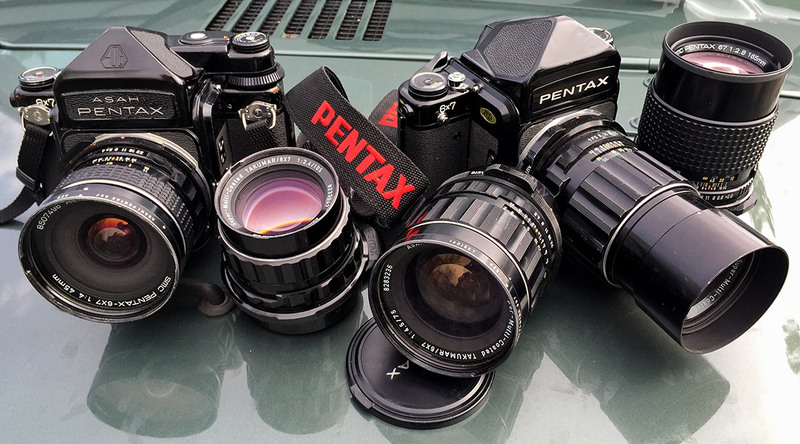 Adapters are available that make it possible to use 6×7 system lenses on both the Pentax 645 medium format system and on K-mount 35mm SLR cameras. Designed for use with the wooden grip or the AF400T flash bracket, the quick-focus ring allows focusing with the fingers of the left hand while holding either accessory handle. It mounts by means of a split ring that fits over the focus ring of some lenses and is clamped in place with an adjusting screw. This manual has more details (poor-quality scan, but useable). 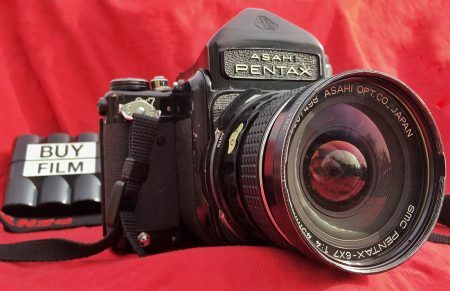 After considering the Pentax 6×7 system for some months, and trolling eBay and other sites daily, I stumbled on mine. I dropped in at Englewood Camera when I just happened to be in that part of town and, as I’d done several times previously, asked Andy if anyone had brought one in. To my surprise, they had — and it appeared to be in very good condition and work quite well. It included an unmetered prism and presentation case, and had no lens, but I bought it anyway. I ordered the 75mm f/4.5 from UsedPhotoPro the same day, and within a week I was taking pictures. I had a little trouble at first — the shutter was dragging occasionally, frame spacing seemed a tad messed-up, and the shutter would intermittently stick open at a few speeds. With exercise, though, everything seemed to fall into place and I happily made pictures for most of 2015, getting some stunning results. Within a couple weeks it was clear that this was the system for me — I’d really nailed it, for once. I made a deal to exchange all my remaining digital gear (Canon 30D body, battery grip, several lenses, flashes, and those other miscellaneous accessories you accumulate after nearly 10 years with a system) for several Pentax 6×7 lenses, a TTL-metered prism and some filters. Good 82mm filters can be really expensive. Seriously. In the deal I wound up with the 45mm f/4 and 165mm f/2.8 lenses, some spare caps and a variety of filters for both 67mm and 82mm threads. I picked up a few other bits and pieces from Englewood Camera, KEH.com and UsedPhotoPro over the summer, expanding my kit as I expanded my photography. I even stumbled on a set of strap lugs for about half the going rate on eBay — and they came in the unopened original packaging, on the ends of brand new Pentax strap! Normally I’m a firm believer in the simple Domke 1.5-inch black gripper strap, as much because they stay exactly where I put them on my shoulder as because a strap with red stripes and a giant logo in the middle (be it Canon, Nikon or Pentax) is about the same as wearing a “Steal my expensive camera!” sign on your back. This strap, though, has a fantastic grippy inner lining and just plain looks great. I don’t mind being a Pentax billboard with a camera this cool under my arm. I was fully outfitted by sometime around the middle of August, 2015. I’d even found lens hoods for the 45mm and 105mm, with individual leather cases. 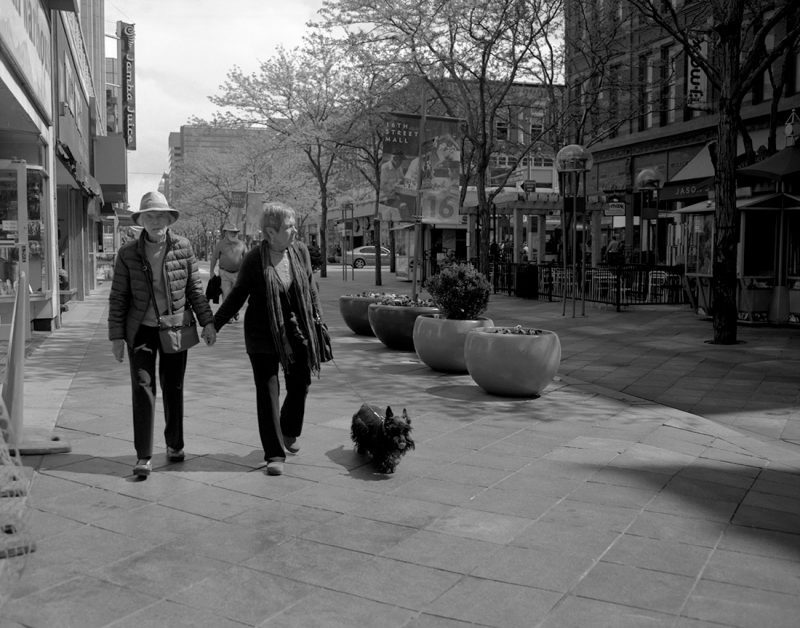 My first rolls were shot on the 16th Street Mall in Denver in April, 2015, with some slightly-expired Kodak TMax 400 and Ektar 100 I’d been meaning to use up. 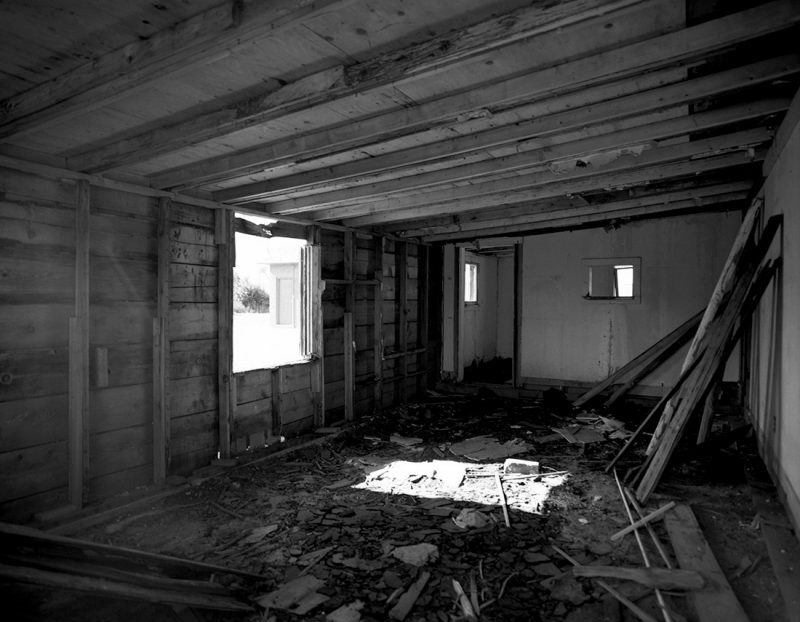 There were a few blank frames, some shutter drags and a huge light leak at one point, but they seemed to improve fast. 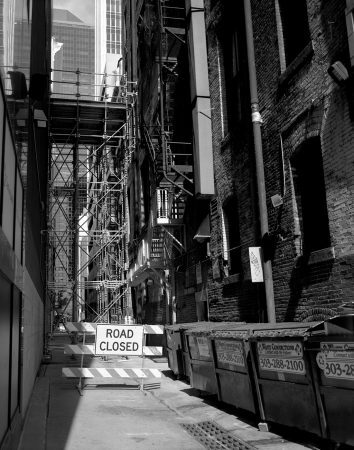 A few weeks after getting the camera and lens, I took it with me to Doors Open Denver 2015 and saw the insides of some cool buildings. I didn’t really know the camera that well yet, and was metering with my iPhone since I hadn’t gotten the metered prism yet. But this was the first time I tried to use the 6×7 for a set of serious photographs. I took a few rolls of Fujifilm Pro 400H with me, which I picked up because it was quite literally the only color 120 film I could get my hands on anywhere in Denver that weekend. The film didn’t impress me especially, but its color rendition is very true and I appreciate that. 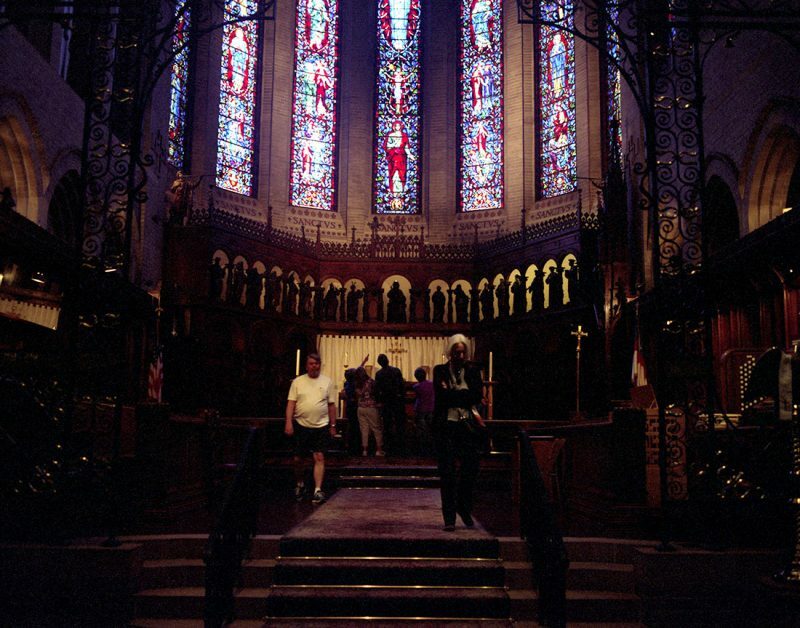 It responds to underexposure almost as badly as Ektar does, however, and I underexposed a number of things in the dark interiors of Saint John’s Episcopal Cathedral in Denver. By June I was ready to get more serious. I bought 20 rolls of Ektar, a pro-pack of Portra 160 in 220 format (just happened to be there), and a couple bricks of Ilford Pan F Plus in preparation for vacation. 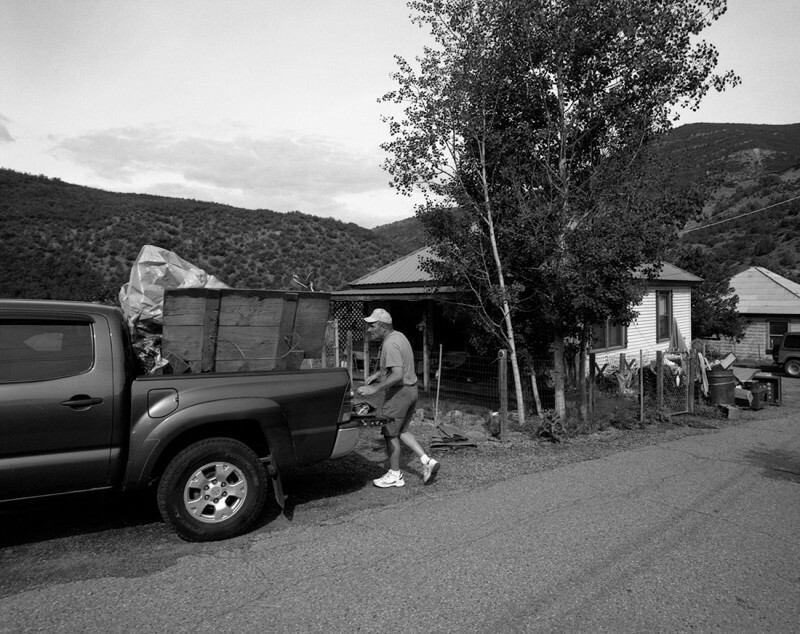 Kate and I spent most of week in and around Paonia, Colo., exploring the history and geology, touring a local sheep farm and tasting locally-pressed apple cider. 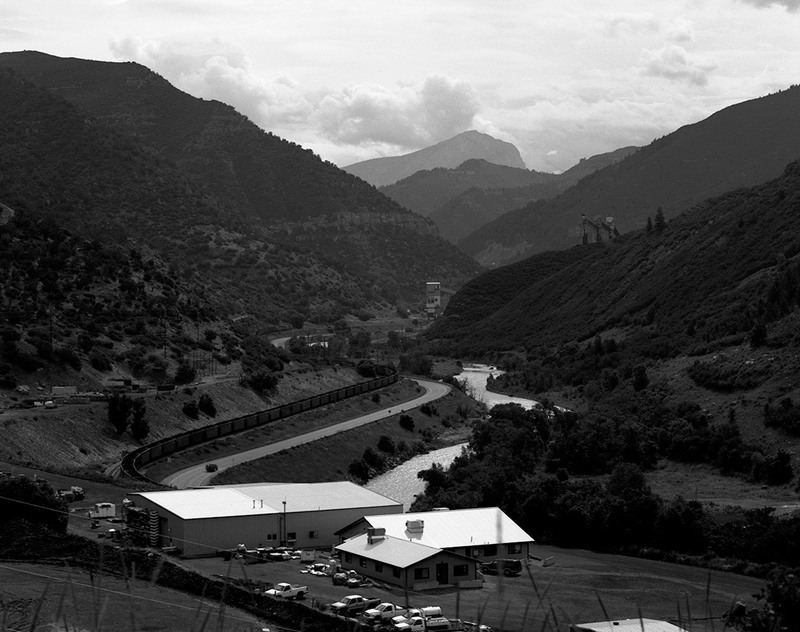 Farm-to-table dinners, mountain passes draped in wildflowers and the annual Paonia Cherry Days Parade and Festival provided ample opportunity to shoot most of the film, although I still had some technical difficulties and failures. I was recovering from a cold when we left, but halfway through the trip Kate was really sick. We wound up heading home a day earlier than planned, although it probably should’ve been two. 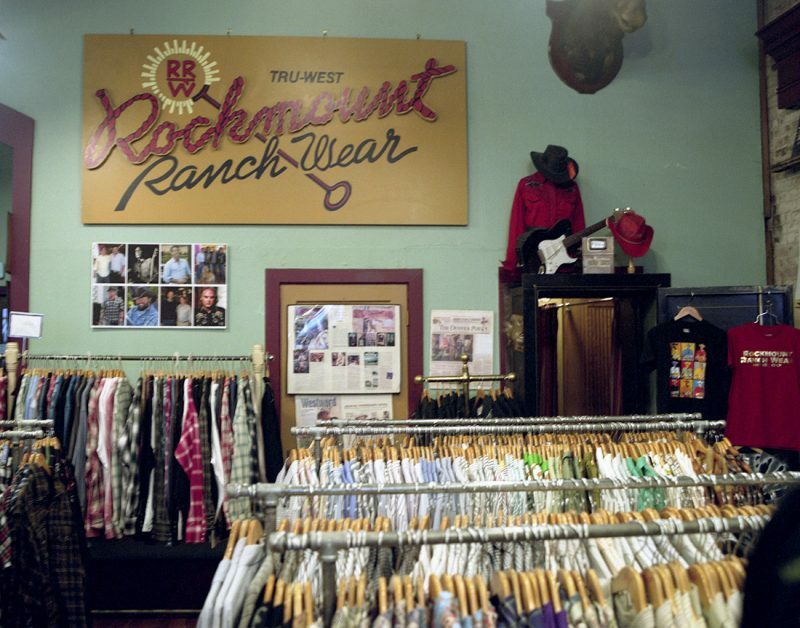 The only other memorable complaint on the trip was the heat — the North Fork Valley can get well over 100 degrees Fahrenheit during the day, and the air currents can prevent it from dropping much below 85 degrees overnight. 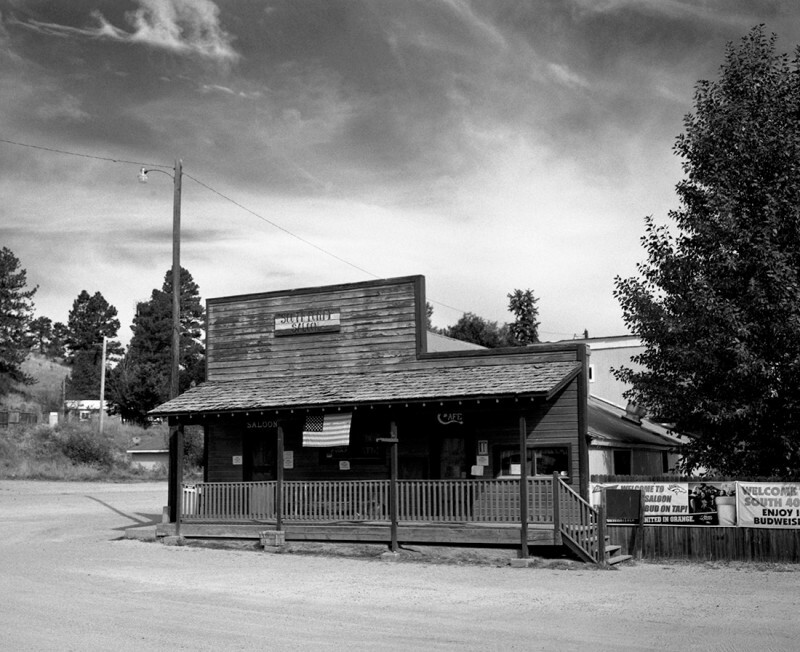 It was on that trip that I shot the first rolls of Pan F Plus in the Pentax that would touch off a project that lasted the rest of the year, and which continues to grow in importance and scope. 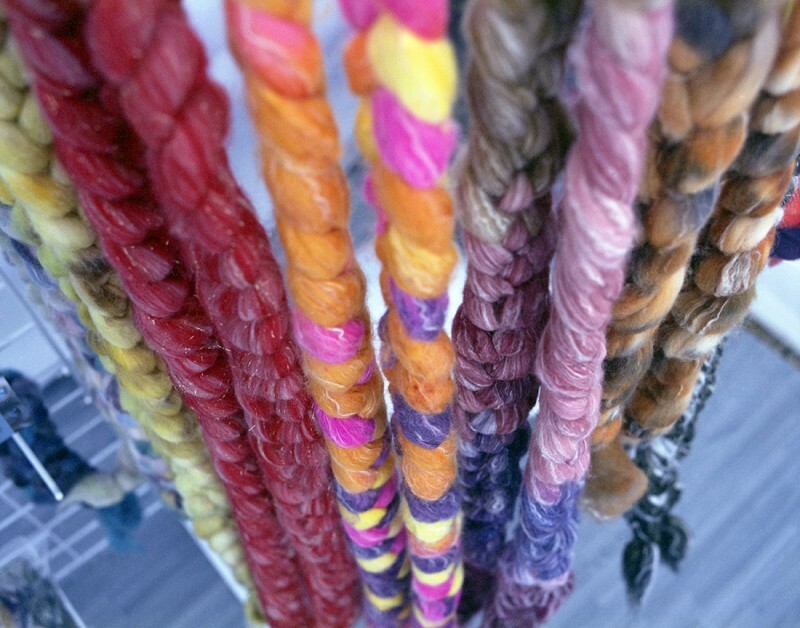 Aside from a few short outings like our visit to the Elizabeth Fiber Festival in September, I haven’t used the Pentax for much else since July. 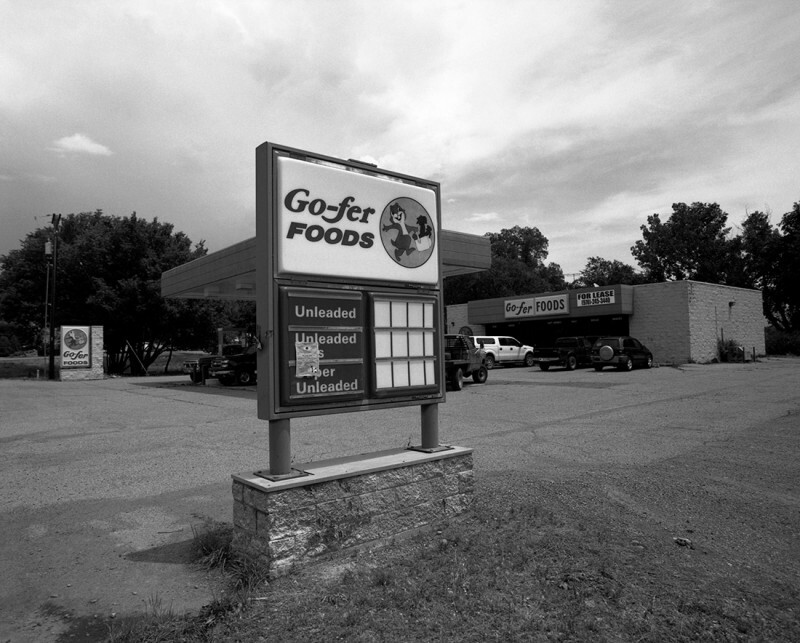 Throughout the latter half of summer, 2015, all through the mild fall and right up against the late-beginning winter of 2015-2016, I fed a steady stream of Ilford’s Pan F Plus to the Pentax all over Eastern Colorado. 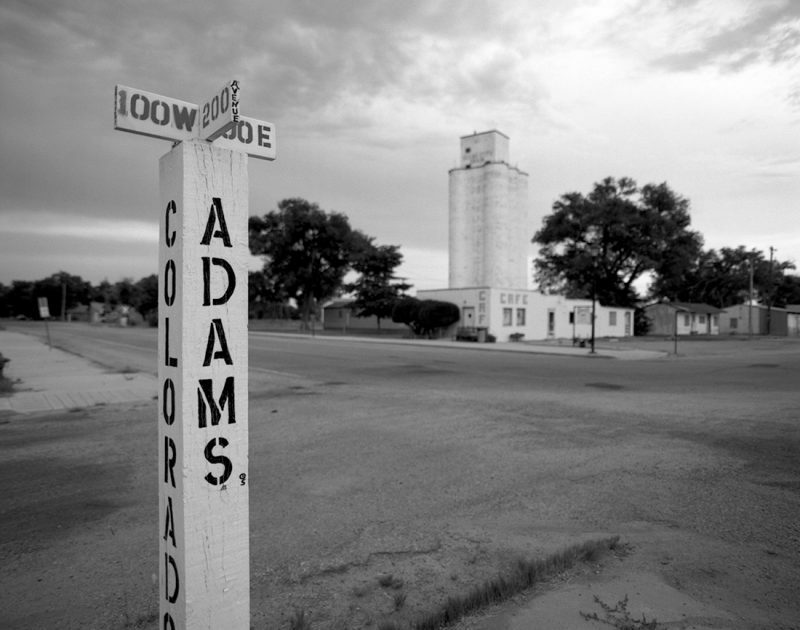 Alone and with assistants friends, I covered nearly 3,500 driving miles and visited dozens of towns, homesteads, and townsites, and even ventured into Southern Wyoming a couple of times in search of the impacts of modernization on rural economies and populations. The true fruits of that search will be revealed soon enough, but they’ve inspired me to continue and expand on that work, so you’ll be seeing more of it as I make more of it. It was during this time, though, that I started work on my first review — a short user review for EMULSIVE — of the system. Nevertheless, I learned a lot about the system through experience, and rapidly went from preferring the 75mm lens to loving the 45mm for everything. 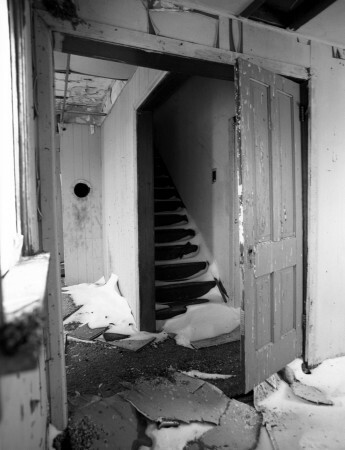 When I spent a few months shooting ultra-wide with my Nikon FM2n, I learned a lot about shooting wide all the time. For one thing, I learned that I like wide better than telephoto. But there’s more to it. 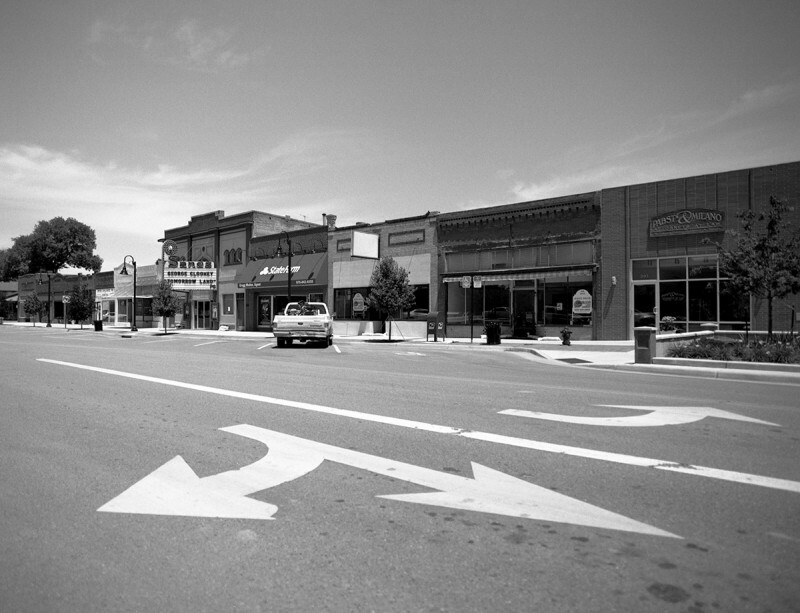 One of the big issues with loving wide angle is that your work can start getting very homogeneous. Wide angle lenses are great for several things — exaggerating a subject, framing a close subject within its broader environment, certain landscapes, or making the very most of leading lines — but if you use them for everything you risk your frames getting boring and running together in a parade of broad views. Nevertheless, I think my wide angle photography chops developed a lot. While I did start to see a lot of similarity in my favorite frames, a lot more of them were keepers. Ten rolls of film in a day is one hundred frames, and as the Pentax 6×7 moved from being a great camera I loved into becoming a true (but heavy) extension of my hand, I was ready to at least make test prints of as many as 50 or 60 of those frames by the late fall of 2015. Unfortunately, even though I wasn’t completely addicted to wide (I was still using longer lenses some of the time. Okay, a little bit. 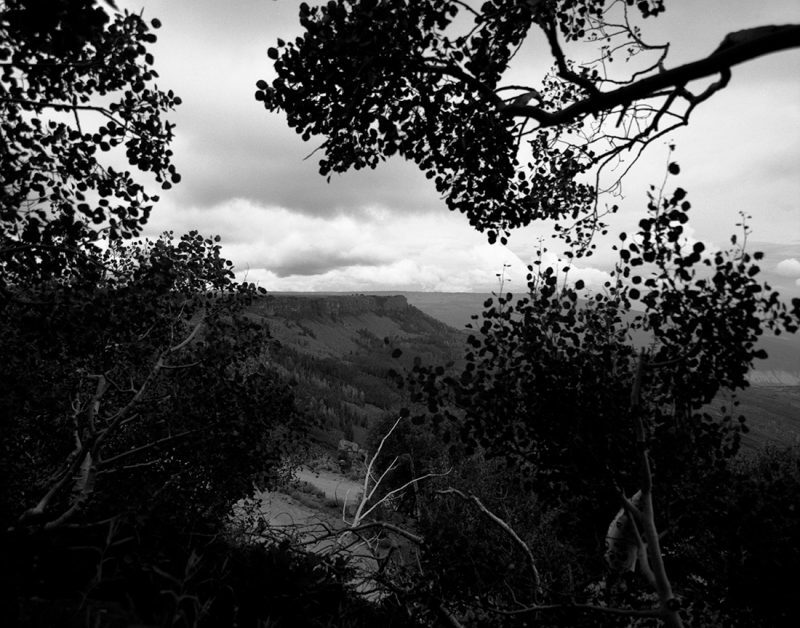 ), I realized later while reviewing a selection of my summer’s work with my friend and Western photographer extraordinaire Dean Krakel that I was still shooting wide. Sticking a long lens on the camera to take a picture of a wide scene a ways away isn’t really a whole lot better than walking closer to it with the 45mm. So my next challenge is to work on getting closer. Robert Capa is famous for having said, “If your pictures aren’t good enough, you’re not close enough.” The much-used quote has been interpreted to mean, alternately, that getting physically closer to your subject will provide a more engaging perspective, and that better photographs demand increased empathy — that your work benefits from getting emotionally closer to your subjects. 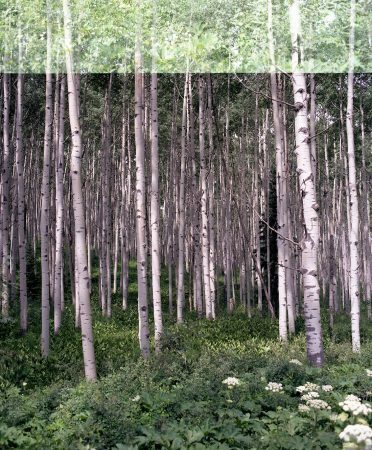 When I first heard the Capa quote in a photojournalism class nearly ten years ago (it’s a favorite of my professor, Kenn Bisio), I went with the first definition — physical distance. Bisio frequently used the quote in conjunction with his encouragement to “focus with your feet” — prime lenses were a requirement in beginner courses. I felt, for a long time, like I was applying it plenty. Even when I first read the PDN article linked above, I felt like I was on track to apply the second definition, too. I think I was wrong. Like … totally wrong. So the next step is to get cracking on getting closer before I start hitting the shutter. In January of 2016 I met up with Craig Pindell for one of those Eastern Colorado outings and the Pentax began to act up again. At first, I blamed it on the cold, although the nominal temperate was around 40 degree Fahrenheit. The shutter kept locking open (and the mirror up), but it wasn’t every frame. Just … a lot of them. I tried the cold-weather battery adapter but that didn’t seem to make a difference. Keeping the whole camera warm by stuffing it inside my jacket seemed to help, but even that was far from a perfect cure. It probably dropped the percentage of frames lost from 70 to 35. Anything longer than the 45mm lens wouldn’t have fit in the jacket, either, compounding the limitation. By sheer chance this happened to be the day Craig, who was consolidating his gear a bit at the time, sold me a Super-Multi-Coated Takumar 6×7 300mm f/4 lens, and his non-MLU 6×7 body. The cold-weather battery adapter was in there, too. I thought that the timing likely couldn’t have been better. With my main 6×7 on the fritz, I swapped my TTL metering prism viewfinder onto the “new” body, swapped lenses, and loaded it up. I made a couple of frames and it started locking the mirror up and shutter open, too. Between #BIFscale16, Expired Film Day, No Gear No Fear (and the Ilford HP5+ single-use camera), and some of the reviews I worked on earlier this year, it was a couple months before I actually had occasion to use the 6x7s again. Thinking it was all about the temperature that day in January, I loaded my gear as usual for Doors Open Denver 2016 — coming full circle. First stop was the Denver Women’s Press Club, in the former home and studio of etching and watercolor artist George Elbert Burr. I loaded up a roll of expired-but-well-stored 220 Portra 160VC and started with a frame of Burr’s studio space. The shutter stuck open, the mirror locked up. I managed two frames out of the first seven attempts and gave up. I switched to my Yashica-Mat and a few rolls of 120 Ektar I had with me, since virtually all the film I have in the Pentax bag is 220. When I got home, I ripped out the wrecked roll of Portra and set it aside. I figured I was going to be on the hook for a couple hundred dollars each for CLAs on both bodies, and that wasn’t really in the budget. The light seals were in good shape, the shutters were both accurate at all the working speeds (unsurprising with an electronically-timed shutter), and everything else generally seemed good as long as the shutter didn’t lock up. Doing some research for this article, I stumbled across some possible fixes I could do myself. 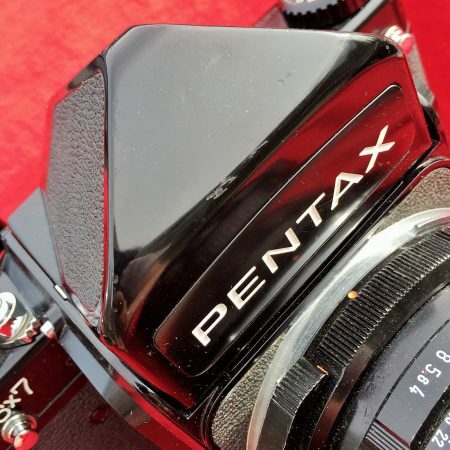 In general, there appear to be two main reasons for the Pentax 6×7 to have a shutter sticking open and the mirror sticking up: the shutter speed selector switch itself, and the mirror electromagnet. It was a good thing I hung onto that wasted roll of 220 film. 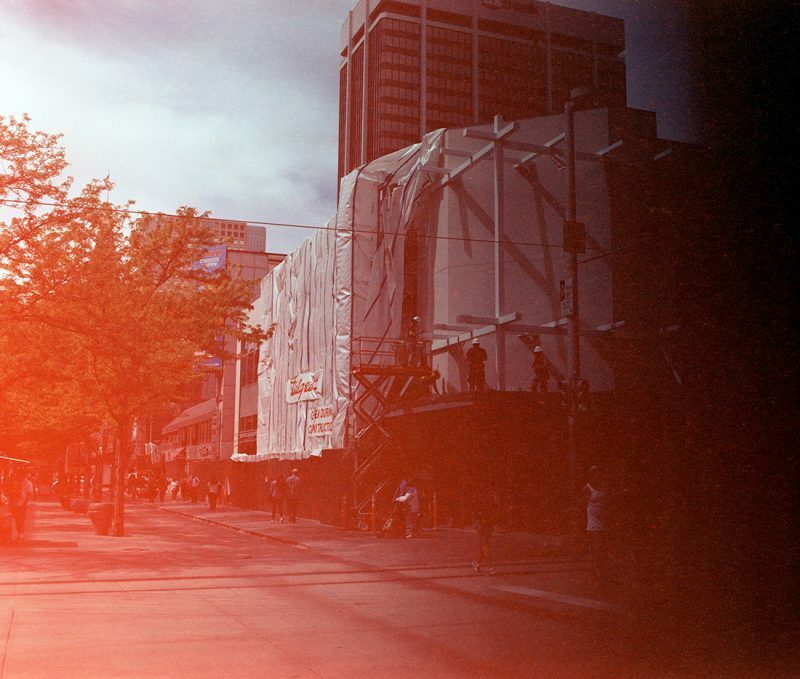 One nice thing about 220 film is that, due to its construction, the film and backing paper are connected solidly at both ends — which means you can run it through a camera in either direction without any hangups. Since I don’t have a shutter key for my 6x7s, one easy way to repeatedly test the shutter is to put film (or a used backing paper) in the camera. With 220 that gives me 20 test fires every time I reverse the film. When the shutter or mirror is sticking mostly at a couple of specific speeds — especially speeds that aren’t neighbors — it’s likely the switch. It’s a rotary switch with a single wiper that selects from a ring of contacts around the switch. Like any electronics out in the world, it’s possible for corrosion or carbon buildup, or any other junk, to pile up on the contacts and prevent a solid connection. It turns out the solution to this problem is relatively simple. Just pop off the shutter speed knob, and take off the left-hand top cover segment. Use a toothpick or matchstick with a little cotton wrapped around the end to clean the contacts with some 91-percent isopropyl alcohol (or electronic contact cleaner, if you have some handy). I followed this detailed tutorial. 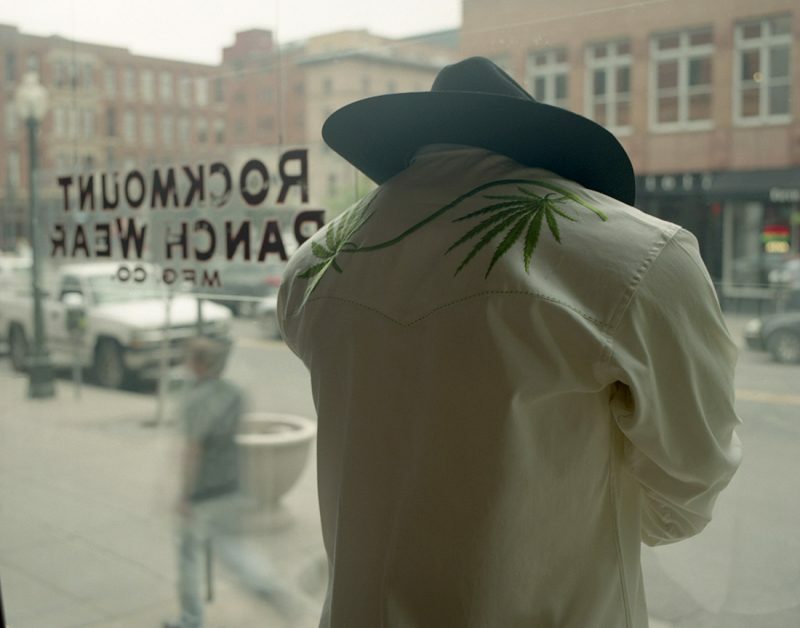 The second body — the one from Craig — was almost exclusively locking up at the 1/4 second shutter speed setting, and sometimes at the 1/30 second setting. 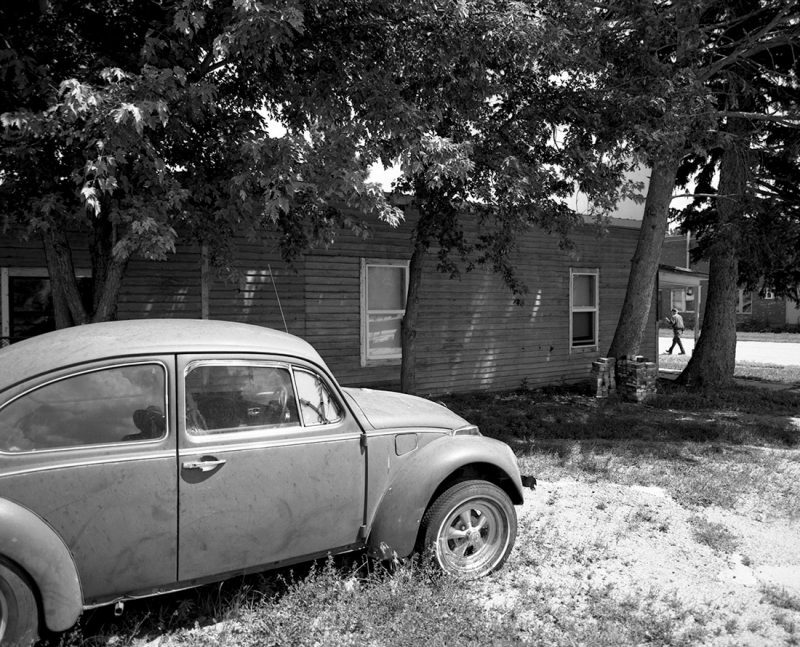 It’s got a little bit of corrosion in a few places, too, and has a name and “Tipton, IN” scratched inside the back door, so it may have been exposed to a good deal more humidity than Colorado cameras usually experience. Those two things in combination led me to the preceding solution. I did discover that the switch on the first generation (my non-MLU body dates to 1968) is constructed slightly differently than what’s shown in the tutorial’s photos. The same repair was possible, but required a bit more delicacy and determination — and it worked! I decided to try the same solution on the later body (whose serial number indicates it dates to about 1987) since it’s quick and easy, but it had no effect. That body was experiencing lockup at every speed 1/30 second and slower, which led me to the second solution — the electromagnet. The mirror rides on springs that keep it balanced in such a way that the electromagnet has to exert only a tiny bit of force to hold the mirror up. 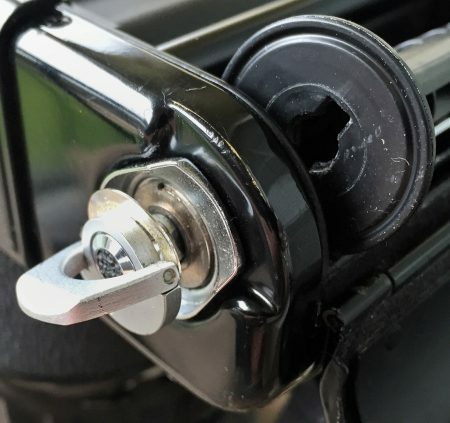 Unfortunately, this means that even a tiny bit of sticky buildup on the magnet’s core can overcome the springs and cause the mirror to stick when it initially goes up. At faster speeds, sheer momentum seems to be able to overcome the hold of the gunk. As the buildup gets worse, though, faster and faster shutter speeds will stick. This fix is a little more complicated and involves removing two pieces of the leatherette covering and two small body panels. I followed the procedure detailed in this video to the letter and had no trouble. With a little cleaning around the magnet core and the contacts, this body is working good as new. 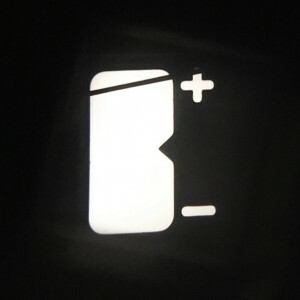 Update (credit to Warren Yee for the note): The long, thin contacts shown in the linked video constitute the Power Switch and Bulb Switch, and require care. If they are dirty, blocked by degrading foam or other debris, or bent, they can cause a similar mirror lock situation. Exercise caution cleaning them so as not to bend them. There’s a detailed photo in this discussion. The electronic and mechanical components of this system are, at least to me, very complicated; if your problem is here, my personal advice would be to seek a CLA from a reputable tech and ask them about it. I do not have any personal experience with him, but Eric Hendrickson is recommended frequently in Pentax forums and elsewhere. I discovered that Permatex Indian Head Gasket Shellac Compound works well for reattaching leatherette. It seems to dry a touch harder than the cement used at the factory, but it’s not the type of hard that feels brittle like superglue. To be absolutely sure both bodies were fixed, I tested each shutter a couple hundred times with an alkaline battery I didn’t care about using up, and I think I saved myself several hundred dollars. Despite the appearance of complexity to the 6×7, there are a number of other minor repairs you can probably handle yourself. One of the more common problems is a loose or broken aperture coupling chain, which can result from changing the viewfinder with a lens attached. Another issue I had was with the meter needle in the TTL viewfinder. By following the last step in this article about TTL metered prism fixes I was able to re-affix the loose prism and get my readout working perfectly. Now the part you’ve all been waiting for (maybe): my actual opinions. By now it should be obvious my opinion is good. This may not be the perfect camera, but can it be said that there is any such thing? I’m not sure I can even honestly say that the Pentax 6×7 is my perfect camera. But it helps me take pictures I’m really pleased with, and it works very much the way I like. In some ways it’s fairly devoid of features — there’s no autofocus, no readouts in the viewfinder for shutter speed or aperture. There’s no self-timer and not even an optional power winder. But what that means is that there’s nothing extra. The impressive stable of lenses, though, and the obvious attention to every detail, makes it clear that this system was designed from the very first step to be exactly what it developed a reputation for being: a versatile and high-performing workhorse camera for serious photographers. While the Pentax 6×7 is renowned for its size and weight, it is surprisingly comfortable in the hand (my hands are big, so your mileage may vary). I find all the controls are very much right where I would put them. The auxiliary shutter speed ring that comes with the TTL finder makes one-handed operation of the speed selector quite easy (not that it’s too difficult without). Changing lenses and finders is easy. The view in the finder is big and bright in most circumstances. 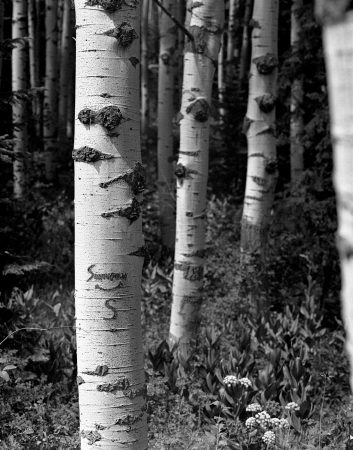 The film advance is smooth and generally works really well. I mentioned the one foible I’d found with it, though. With many of my 35mm cameras, I developed a habit of hanging the camera from my thumb using the advance lever, and giving it a tug now and then to see if I’ve already advanced the film. This is a no-no with the 6×7. After advancing the film, the lever is still operable — albeit more difficult to move. But further actuations of the advance seem to scoot the position of the film ahead without affecting the place where the advance will stop next after a frame. More clearly put: You can shoot Frame 1 at Position 1, then advance to Frame 2 (at Position 2). Position 3 is already determined at this point, but if you continue advancing the lever out of habit, the actual placement of Frame 2 moves ahead of Position 2 a bit each time — maybe by several millimeters. You make Frame 2 and advance, so the film is now at Position 3. Sadly, part of Frame 2 is now occupying some of the space destined to be Frame 3. At first I lamented the lack of a microprism ring on the split-image focusing screen in my main body, but I think that was more because I had been relying too heavily on the microprisms in other cameras. 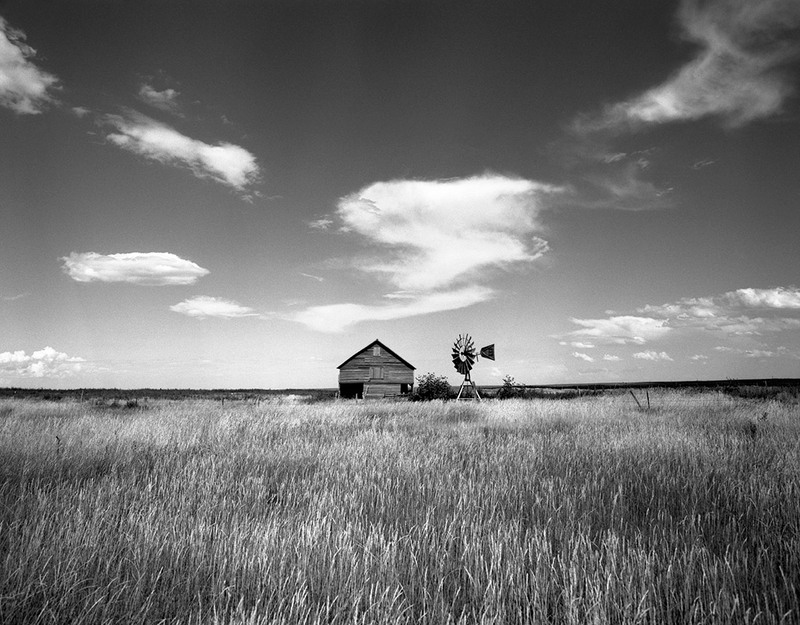 As I got more used to the 6×7’s finder, I learned to focus more in the way I would a TLR — homing in on sharpness by moving in and out in smaller and smaller increments until I was sure it was nailed. I haven’t had occasion to try the waist-level finder with the 6×7, but I imagine it could be really good (and it’s on the wish list). The older non-MLU body has the focusing screen with the microprism center spot, which I like for different reasons. The split-image screen makes it easy to get close to being in-focus quickly with any high-contrast subject matter — lines, in particular. The microprism is a bit easier for focusing on things with more detailed patterns, and can be more useful in low light. Aside from film, the other major recurring expense I’ve found with the 6×7 is batteries. As I said above, I carry multiple spares because they seem to burn out pretty quickly. If I’m careful to keep the meter turned off and the shutter release locked, a battery might last 20-30 rolls of film. I typically remove the battery if I’m not planning to use the camera within a few hours — even just overnight. I generally buy my batteries in quantity to bring the per-battery price down to $5-6. The best options seem to be the Duracell PX28L lithium (4 for $19.99), Varta V28PX silver oxide (10 for $61.31) or the Exell S28PX silver oxide (5 for $27.47). There are other varieties, and some are available in insane quantities if you really want to push the per-battery price down. One of the early notes in my notebook opines that the Battery Check button is easy enough to press that it could be getting pushed in the bag and draining the battery, so that’s worth watching out for. While my earlier TTL metered finder has an “On/Off” switch, later versions have a momentary-on switch that turns the meter on for just a minute or two, in order to conserve battery power. Some have complained that the massive mirror swinging up and down contributes vibration that causes motion blur in their photos, but I haven’t seen this at all. (Some even think the shutter itself can cause motion blur with the mirror locked up.) For me, at least, the 6×7 defies even the so-called “reciprocal rule,” which states that you shouldn’t hand-hold a photo at a shutter speed that’s less than the reciprocal of the focal length of the lens being used. With my 45mm lens, this would imply that I shouldn’t be hand-holding any slower than 1/60 second, or maybe 1/30 (another common rule of thumb on its own). Instead, I’ve found that the weight of the Pentax 6×7 is enough to make holding it steady easy. Getting a sharp shot at 1/8 second hasn’t been a problem for me, and even a few at 1/4 second have worked out. Of course, that’s a short lens — a longer lens would obviously present more problems. The 300mm, for instance, is hard enough to hand hold that I imagine a sharp picture couldn’t be made with it at anything slower than 1/125 second. Loading film can be a bit cumbersome for on-the-go situations. I usually need a place to set the camera down, or to balance it carefully on my bag, since a third hand would otherwise be required to move the film and spools around without dropping the camera. Speaking of dropping it, one of the best things about the size of the beast is that there’s plenty of area to grip. I always hold my SLRs with my left hand under the lens, but the lens mount on the 6×7 provides a big flat area to rest on the heel of my hand. It balances perfectly there, leaving my fingers free to adjust aperture and focus, rarely requiring my to drop the camera from my eye. I bought a used Domke F-1X “Little Bit Bigger” bag to carry my 6×7 kit in, which has more than ample room for one body with a short lens, four more lenses in the padded compartments, two filter wallets, notebooks and tons of film. The full array was recently featured in Japan Camera Hunter’s “In Your Bag” series. I won’t say it’s easy to carry all that at once, but the Domke at least makes it manageable. 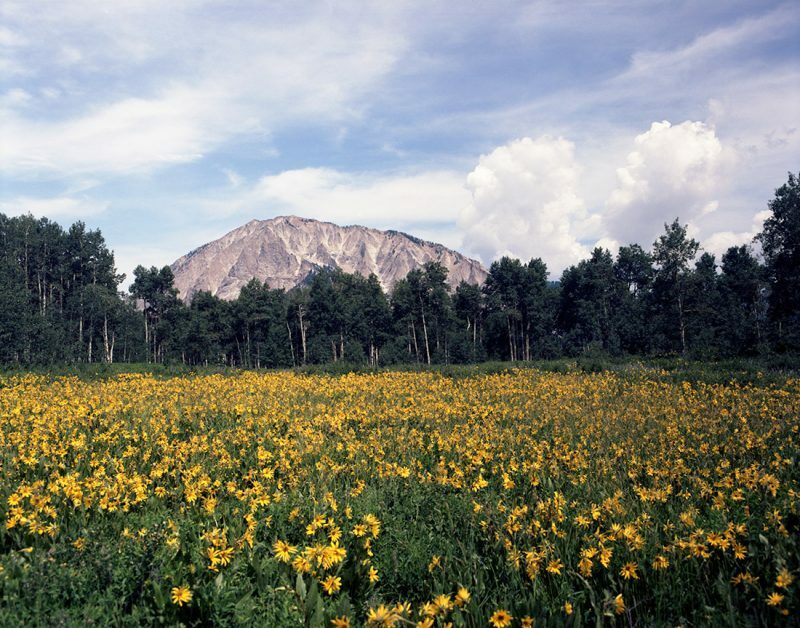 Photographers run the gamut from those who are happy with Sunny 16, or just exposing by feel, to those who insist on using a handheld meter — or even a spot meter — for every frame. Using the meter in the camera has always been a happy middle point for me. Each camera and meter can take a little getting used to in order to get the most out of it and make good pictures, and with that experience an external meter is definitely not a requirement. The TTL prism on the 6×7 is no different. I’ve seen a few reports that the TTL meter suffers from creep over time — losing accuracy. But it can be calibrated and the Pentax 6×7 system (except the early non-MLU bodies, in some cases) are still serviced by many repair shops. The TTL metering prism is an averaging meter, meaning it attempts to take an average reading of all the light in a scene rather than giving extra attention to the lighting in the center of the frame. Some sources have claimed that it appears to be at least somewhat center-weighted, which coincides with my experience. It’s definitely not an 80/20 split like many center-weighter meters, but it might be 60/40 or something similar. Since learning how to use this meter to get the kinds of negatives I want, I’ve managed to take a lot of great pictures using nothing more than the metered prism and a little experience. 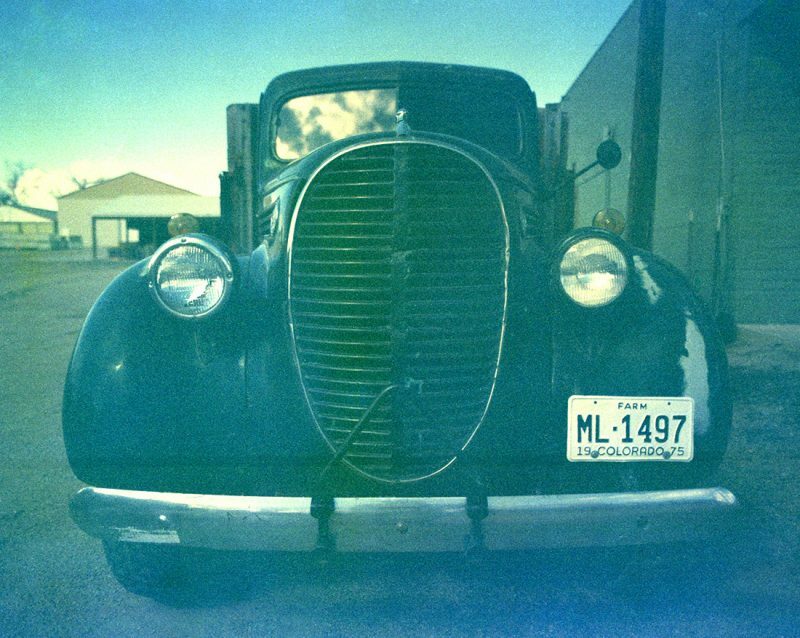 I’ve used mostly black and white film with the 6×7, but a little color, too. The long and the short of it is this: in spite of some quirks and imperfections, this is one hell of a camera and one hell of a system. You can make a lot of great pictures, in a studio or in the field, quickly or cautiously, with this system. Additionally, if you’ve been thinking about jumping into medium format and you like the SLR style, this is your perfect springboard. You can confidently jump in with both feet (or both hands — you’ll need them!) if you get the chance.